While we prepare for this year’s Summer Art Intensives, we are remembering all the fun times from previous years. An art/work/place Summer Art Intensive is all about creating great art, making new friends, and learning while having fun! This year’s camps will be the best yet, so don’t miss out on this chance to have a great Summer! Happy campers painting canvas totes! A camper with her beautiful Kandinsky project! The holidays are over and school is back in session, which means that Summer will be here before you know it! Now is the time to start thinking about your child’s Summer schedule. What better way for your child to spend their Summer than at an art/work/place Summer Art Intensive! 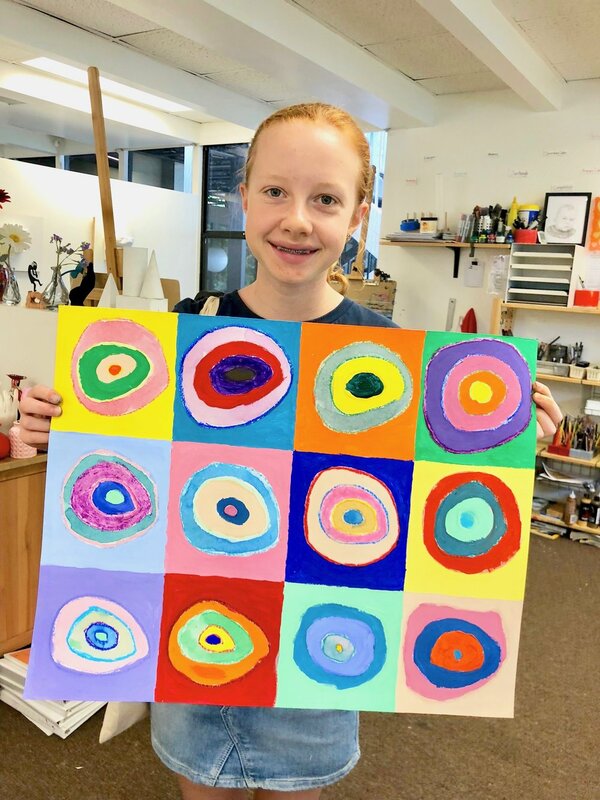 Our Summer Art Intensives are available for ages 6 to 18 and will be filled with lots of different fun art projects, from painting and printmaking to everything in between! With many weeks available, you will be sure to find one to fit your schedule. Register for your space today! We couldn’t be prouder of our student, Maya, who was one of the National Winners of the 2017-2018 Christmas Artwork Contest of the Missionary Childhood Association! Maya with Miss Sam and her beautiful work of art! Merry Christmas from everyone at art/work/place! We hope that you have a wonderful holiday season filled with friends, family and joy! Happy Thanksgiving to all from everyone at art/work/place! Have wonderful holiday!